Happy Sunday! If you have ever skipped rocks (and if you haven't, by gosh, put it on your to do list this week! ), I am sure you have noticed the ripples the rock leaves as it glides over the surface of the water. Each ripple increases in size until it is touching and overlapping and changing the other ripples. Our lives and actions are like the ripples on the water--touching and changing others. What we do and how we interact with people matters. 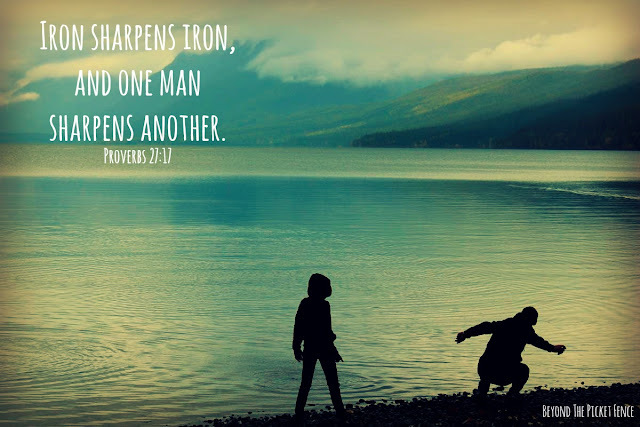 We can sharpen each other and make each other better, or sadly the opposite. God created us to need each other, to help each other, to make each other better. Today, as we remember 9-11 and all of the lives forever changed that day, let's work to positively change lives with our day to day contact and interactions. I hope I can do something to make someone's life a little better. Maybe just a smile or a greeting, maybe something bigger. I want to try. That is all it takes sometimes. Our actions "bump into" people every day, I pray that bump is positive and uplifing!